Tuesday December 17 1907 I did not have so much house-work for today. Billy came back to work. I had a letter from Mrs [Brown?]. Will took it down town. I walked up to Mrs Dennis in afternoon. Called to see Carrie's baby. Will drove up for me. I finished Mollie's collar in the evening. a beautiful day. 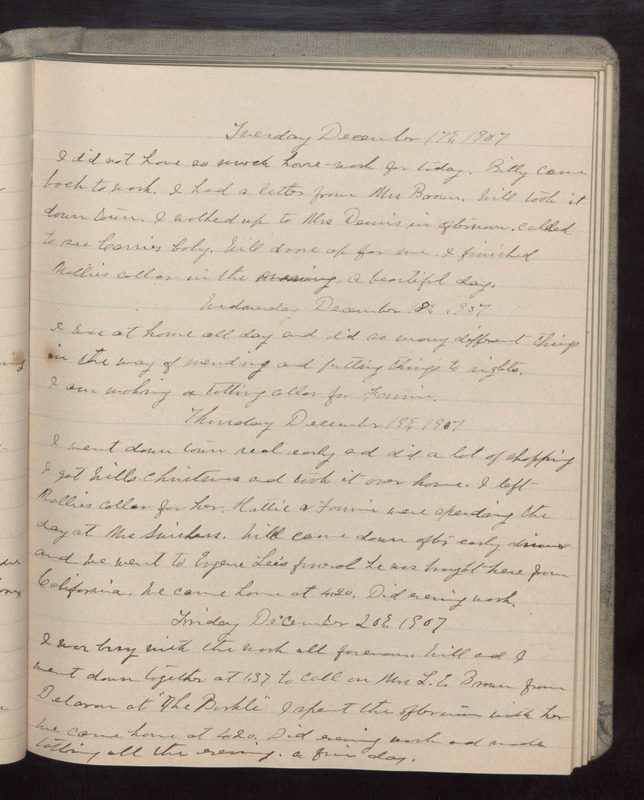 Wednesday December 18 1907 I was at home all day and did so many different things in the way of mending and putting things to rights. I am working a tatting collar for Fannie. Thursday December 19 1907 I went down town real early and did a lot of shopping I got Wills Christmas and took it over home. I left Mollie's collar for her. Hattie & Fannie were spending the day at Mrs Swishers. Will came down after early dinner and we went to Eugene Lee's funeral He was brought here from California. We came home at 4.20. Did evening work. Friday December 20 1907 I was busy with the work all forenoon. Will and I went down together at 1.37 to call on Mrs L.E. Brown from [Deloran?] at "The [Borkle?] I spent the afternoon with her We came home at 4.20. Did evening work and made tatting all the evening. a fine day.